WWI Profile: David Lafayette Dosher 1893-1919 | Friends of Fort Caswell Rifle Range, Inc.
David Lafayette Dosher was born and raised in Southport, Brunswick County, NC. One brother, Charles Edward Dosher also served in WWI. During the fall of 1918 the commander of the Services of Supply, Maj. Gen. James G. Harbord, requested personnel from three combat divisions for labor units in his command. On September 17, Pershing’s headquarters reassigned three divisions scheduled to arrive from the United States to Maj. General Harbord. One of these divisions was the 87th. It was broken up for laborers in the Services of Supply. The division did not lose its identity as a combat unit. When the Armistice was signed, it was under orders for service at the front. However, the division never served in combat during the war. Details of the 348th Infantry could not be found. What is known is that on February 9, 1919, David Lafayette Dosher died of influenza and broncho pneumonia. When his Company departed Bordeaux on February 25, 1919, his name was not typed and crossed out on the passenger list, which would provide more information on his last days. Southport, March 5. — Cook David L. Dosher, whose name recently appeared in a casualty list as having died of disease in France, is a son of Jesse Dosher, of this place. As far as is known, he is the first Southport young man to have lost his life in the big adventure. Southport furnished Uncle Sam with a large number of sailors and soldiers, but they were fortunate in being spared. In 1929, David’s mother, Mrs. W.J. 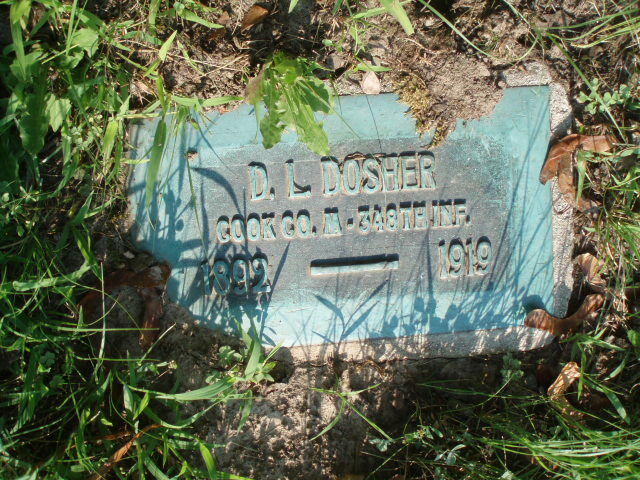 (Margaret Ann) Dosher, was given the opportunity to take a Mother’s Pilgrimage to visit his gravesite. All three mothers listed from Brunswick County declined. More information can be found in Claudie Hall McCall’s WWI Profile. David was laid to rest in Suresnes American Cemetery and Memorial in France (no photo is available). A memorial flat marker is also in place at Toledo Memorial Park, as shown above. Note: David’s Ohio WWI Service Card is not linked from this post but is available in Ancestry.